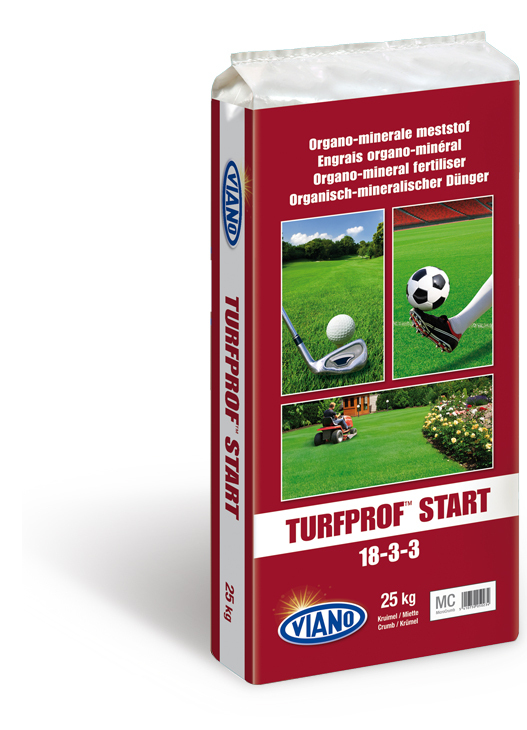 Viano TurfProf fertiliser is a specially developped range of organic and organo- mineral fertilisers for professional use. This premium quality organic and organo- mineral range is extremely sustainable and respects the environment. 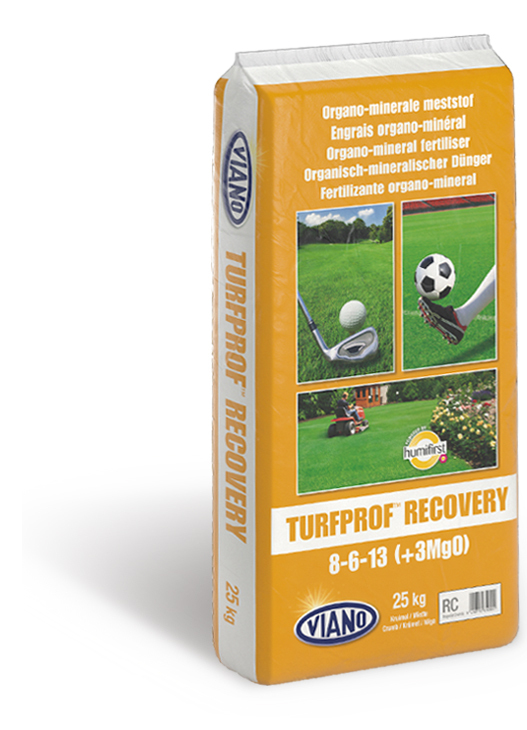 Viano TurfProf products release their nutrients gradually over a period of 2-3 months, depending on their composition, ingredients and chemical analysis. Turfprof Professional solutions for treatment on golf courses, football pitches, sport fields, cricket fields and amenity. A well ballanced organo-mineral fertiliser, specially composed for preseeding. Ideal for the fertilisation on golf courses, football fields. This formulation, with a high content in fast acting nitrogen and partially organic slow working nitrogen can also be applied after sowing to establish a good ‘start’ of the lawn. Works up to 2 months and guarantees a continuous growth. This formula contains fast and slow working components. Accelerate growth after colder (winter) period. A well balanced organo-­ mineral fertiliser for preseeding but easely to apply for the maintenance fertilisation on golf courses, football fields and sport fields. This formulation, with a high content in fast acting nitrogen and partially organic slow working nitrogen can also be applied after sowing to establish a good ‘start’ of the lawn. Works up to 3 months and guarantees a continuous balanced growth. This formula contains fast and slow working components. Specially developped for golf courses, cricket-­ and footballfields and green area. The specific and unique composition guarantees a long working period up to 3 months, green vivid colours due to the presence of iron, in combination with magnesium. TurfProf GREENBOOST is an organo-­ mineral fertiliser with immediat action which releases the nutrients gradually. This formulation gives a better resistance to drought and intens accessing of the treated play-­ area. Viano Turfprof Green Boost is only after construction ( as maintenance fertiliser) applicable. 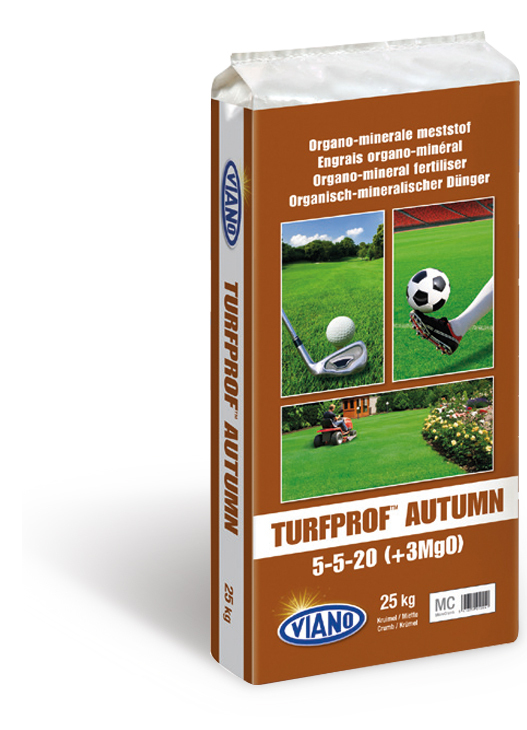 Organic based fertiliser for application in colder periods (autumn). Contains extra magnesium for green colours through autumn and wintertime. Contanis a high concentration in potassium to fortify turf during winter. Can be used at the end of the season, together with mechanical care. Less risk of leaching. Application of this fertiliser results in a stronger turf (less sensible to sickness, plagues, diseases and bad weather conditions) with better condition for next spring. When using high concentrations of this fertiliser it has a indirect moss inhibiting effect. This formula works up to 3 months. Well balanced organic fertiliser with a unique composition. Proven ideal for fertiliseation after scarification or to apply as preseeder. The presence of magnesium guarantees green vivid colours. This product contains Humufirst, a mixture of humic acids and fulvo- components to optimise root formation and the strong inrooting of the seeds. Can also be applied in combination with vertidraining. Works up to 100 days. 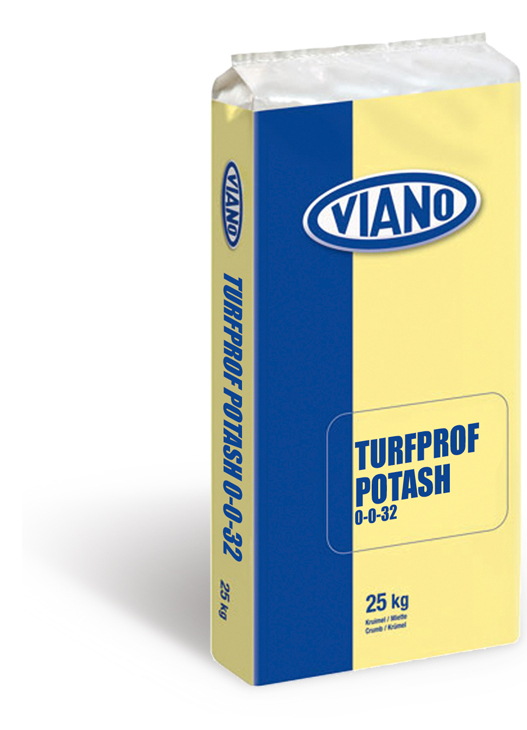 TurfProf POTASH is an organic based fertiliser with very high content of potassium (kalium (K)). Ideal to apply in spring or autumn on poor sand-­ based pitches and soils as maintenance fertiliser on lawns or in plantations. With a gradual release of the nutrients this fertiliser increases the resistance against drought and intensive acces of the treated area. Works up to 2 months. 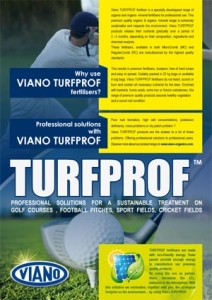 Can be used in combination with all other Viano TurfProf range products.